Video Recipe - This is one of my best basic recipes. 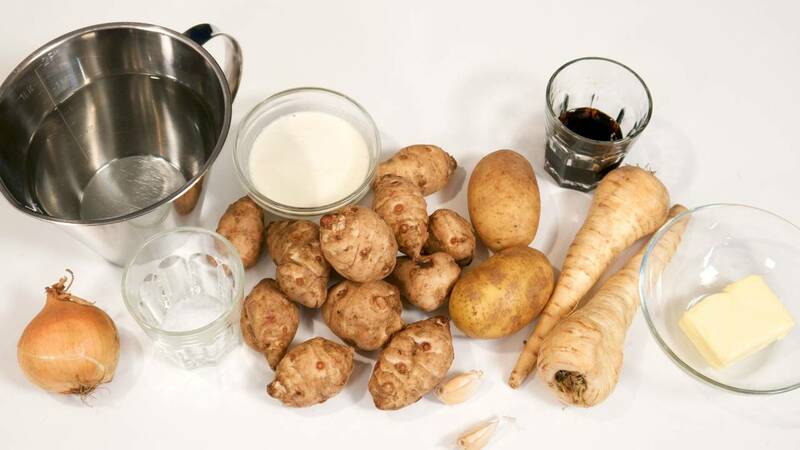 I use it both to make creamy winter soups and "creamed / puréed" root vegetable (mash). The only difference between the soup and the mash is the amount of butter and water. You can even change the vegetables following very simple rules, so the recipe can be varied endlessly. Cut them into approx. ½ cm (1/4 inch) thick slices. This will make them cook at the same rate. Remove the skin from the garlic and chop them roughly. Brown the butter. Then add the onion and garlic. Saute the onions until they become translucent. Bring to a boil, and then turn down the heat to simmer for approx. ½ hours. When you can "squish" the root vegetables against the edge of the pan, they are done. Pass through a sieve, or use a hand blender or a blender. If you use a blender then split it into several small portions that you blend one at a time. Serve with sour cream and a little smoked ham or bacon, in strips. The weight of the vegetables are with skin. You can use chicken or vegetable stock instead of water. Then you don't need to use soy sauce or fish sauce. 1 part potato. Without the starch in the potatoes it may very well be too watery. But if there is too much potato it can become "slimy" in its texture. 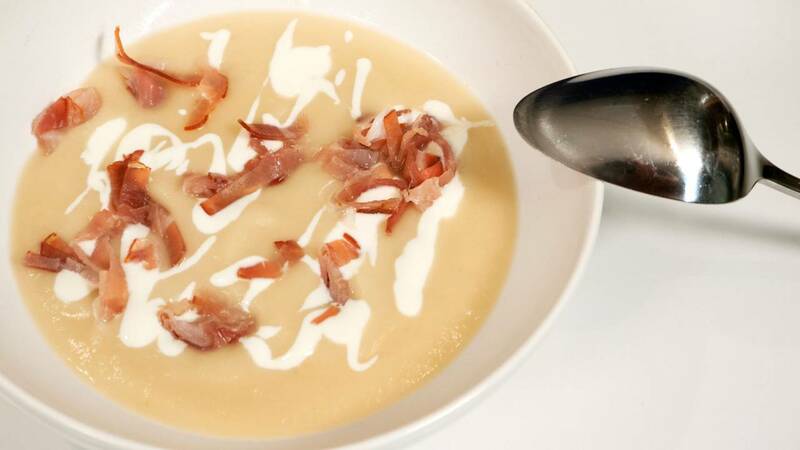 To make a creamy soup, just follow the recipe as it is. If you want to make a puree / mash instead of a soup, add more butter. It can easily absorb 250 g (9-10 oz) of butter:-D instead of the 50 gr (2 oz) as stated in the recipe. Do NOT put water into the mash version. Just add butter and cream at the beginning, and then simmer, with a lid on, with only that. Finally, you can add more cream if the consistency is too thick when you are done pureeing it. The cream version likes to be seasoned with tarragon. Which makes it resemble a Bearnaise sauce.